a DUI Arrest in Arizona. After an Arizona DUI arrest, it’s wise to complete an Arizona MVD DUI Screening. The screening is required to get a restricted driving permit and to reinstate your license. 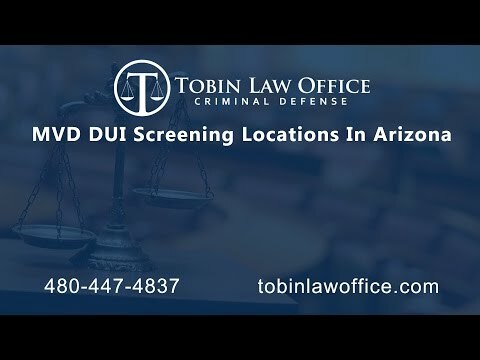 While you have the right to timely contest your DUI suspension, it’s still advisable to do the screening.On this page, you’ll find a comprehensive list of Arizona’s licensed DUI screening centers. These screening companies can quickly screen you and provide MVD with electronic proof. They’ll also provide you with a completion certificate. The screening takes about 45 minutes and is administered by a behavioral health professional; it costs about $80. The screening involves a series of questions about your use of drugs and alcohol. While most places screen you in person, some allow you to complete it online or over the phone. Based on your answers to questions, they’ll recommend a certain amount of counseling hours. You don’t need to complete those hours, unless and until, a Judge orders you. Prepare for a 90 Day DUI Suspension. A DUI license suspension can happen as early as 15 days after an arrest when your license is immediately taken by police. If they let you keep your license, your license could, instead, be suspended on a later date when later reported to MVD. That’s why it’s important to ensure that your address is current with MVD. Otherwise, you may miss important notices about your license status. You can update your address with MVD by visiting this page: Service Arizona Address Update. If you complete the screening, and you’re eligible for a restricted permit, MVD will mail you one about 20 to 30 days into your 90-day suspension. You cannot use the restricted license until the first 30 days are over. If you requested a hearing with MVD, and the suspension was upheld, you can get the restricted permit by visiting an MVD office. The restricted license allows you to travel for the following: work; school; to and from screening, education, or treatment facility appointments; and, to and from probation appointments. After the restricted period ends (and the 90-day suspension is over), your license reverts back to a suspended status. As such, you’ll need to reinstate your license online at Service Arizona or at an Arizona MVD office. The Restricted License is Only for Arizona License Holders. Unfortunately, only Arizona license holders are eligible for the restricted license. While Arizona doesn’t have the authority to take or alter your out-of-state license, it can restrict your right to drive in Arizona. The Arizona suspension will be mailed to the address listed on your citation. Arizona will also report the DUI to your licensing state, who in turn, may suspend your driver’s license there. For that reason, out-of-state license holders should ensure that they’re receiving notifications from their licensing state. Ultimately, it’s up to the issuing state on whether or not to suspend your driver’s license for the Arizona DUI arrest. Screening is a face-to-face interview that lasts between 30 minutes and three hours and is conducted by a behavioral health professional or a behavioral health technician. The behavioral health professional or technician must administer at least one standardardized test for measuring alcohol dependency or substance abuse.Treatment is based upon the information and results obtained from the DUI screening agency or referring court. Treatment includes 16 hours of DUI education and at least 20 hours of group counseling and is provided by a behavioral health professional or behavioral health technician. Education is provided in a classroom setting. Education consists of at least 16 hours in the classroom setting and is provided by a behavioral health professional or behavioral health technician. *** This listing only identifies the counselor/facilities that are electronically reporting to Motor Vehicle Division. TREATMENT ASSESSMENT SCREENING CENTER, INC.
ARIZONA BEHAVIORAL COUNSELING AND EDUCATION, INC.
EAST VALLEY SUBSTANCE ABUSE CENTER, INC.
LIFELINE PROFESSIONAL COUNSELING SERVICES, INC.
VALLEY EDUCATION AND TREATMENT, LLC. LA PAZ COUNSELING SERVICES, PLLC. HORIZON HEALTH AND WELLNESS. INC.
LITTLE COLORADO BEHAVIORAL HEALTH CENTERS, INC.
SOCIAL SERVICES INTERAGENCY COUNCIL OF LAKE HAVASU CITY, INC.
HUALAPAI TRIBE/HEALTH EDUCATION & WELLNESS DEPT. SOUTHWEST BEHAVIORAL AND HEALTH SERVICES, INC.